Who gets to live in base housing when a dual military couple separates? If two Soldiers are married, live in post housing, and cannot get along who has to leave post housing? First off, this is a sensitive area that requires consultation with your command’s servicing Staff Judge Advocate. My comments here are solely my personal opinion based on previous cases I have dealt with and is not to be inferred in anyway as a legal interpretation or legal advice. Are the Soldiers seeking or have plans to seek divorce? However, this is not to indicate that there is no recourse for the command/installation. I assume that since you mentioned that the two Soldiers “cannot get along” there have been some domestic altercations, either verbal and/or physical. If these issues are documented with the PMO and/or command, the housing authority, usually along with the installation commander or their designee, can order one or both of the Soldiers out of post housing. Does the person who wrote the counseling...Does the person who wrote the counseling have to sign it? 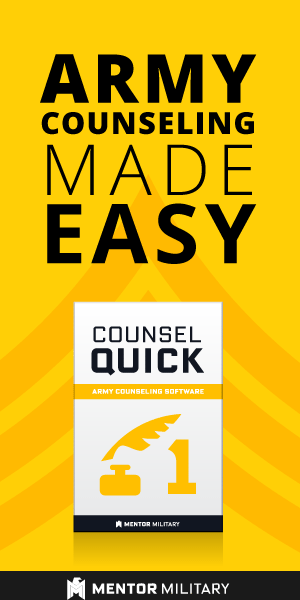 Do I have to allow a Soldier time to res...Do I have to allow a Soldier time to respond to a counseling statement? Very interesting topic here. As a senior NCO or officer, you have to be careful with this topic. You can counsel your Soldiers on the issue at hand, but make sure you get input from the housing office/JAG/ACS. That way you don’t get yourself into trouble.